Work is progressing nicely on my empire dresser! 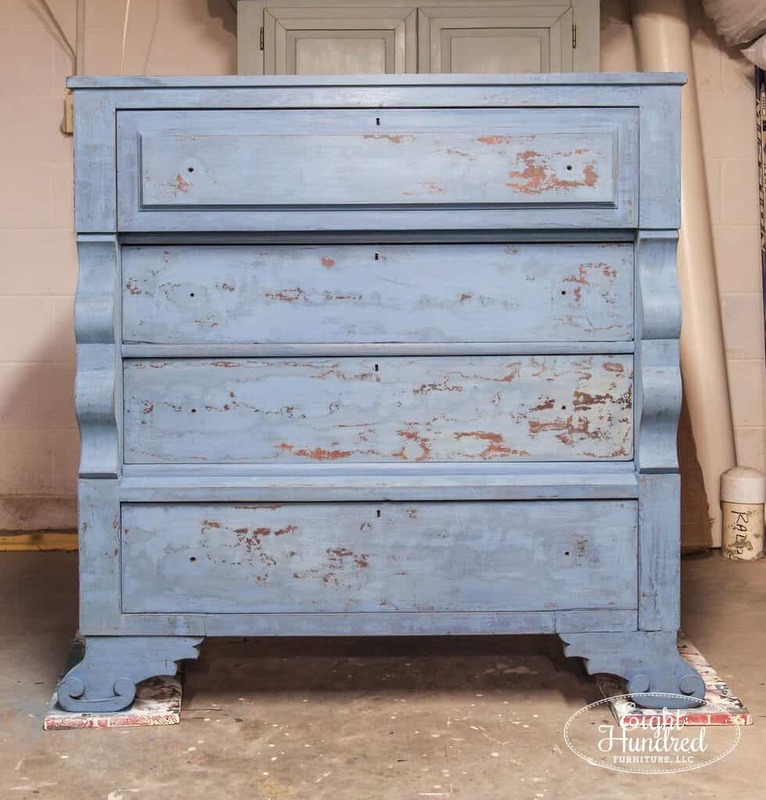 It’s all distressed and looking fabulous and now it’s time to finish it with Hemp Oil! If you need to catch up on the painting and distressing part for this piece, you can do so below. 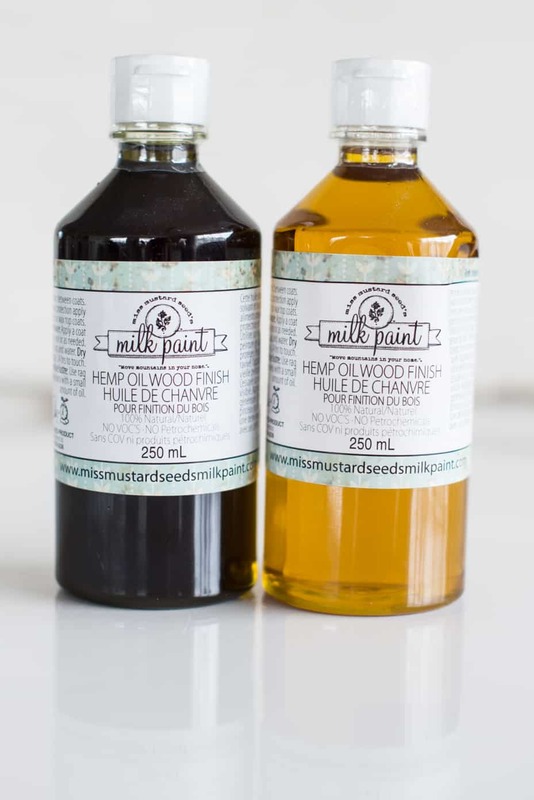 The first finish that I’m going to apply is Miss Mustard Seed’s Hemp Oil. 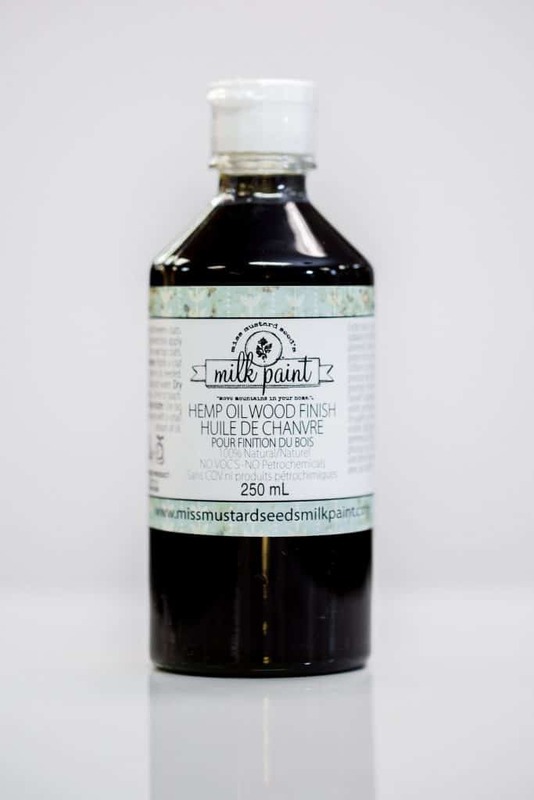 Hemp Oil is a solvent-free oil finish that is produced by cold-pressing hemp seeds and processing it to be a quality wood finish. 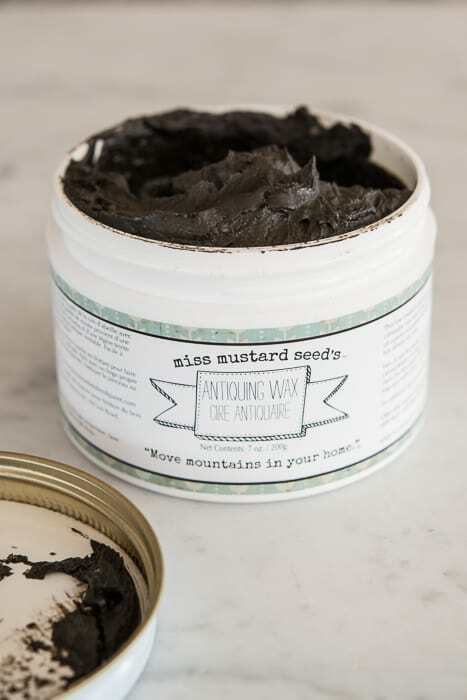 Miss Mustard Seed’s Hemp Oil provides a deeply penetrating finish that protects from the inside out. It both looks like and smells like the olive oil that’s probably in your kitchen cupboard now. It can range in color from light yellow to dark green. You can click here to learn why the color ranges from one pressing to the next. I like using Hemp Oil as my first layer of finish on pieces that have dark and rich colors like Flow Blue, Artissimo, Tricycle, Curio, Typewriter and Boxwood. It makes these highly pigmented shades look their darkest and richest. Hemp Oil penetrates the deepest of all the finishes in the MMSMP line, so it’s an ideal choice over dark colors. To start sealing my dresser, I poured a bit of Hemp Oil into a dish. I use Hemp Oil so much that I buy it in the largest size it comes in – 3.78 liter jugs! My favorite way to apply it is with a natural bristle brush. 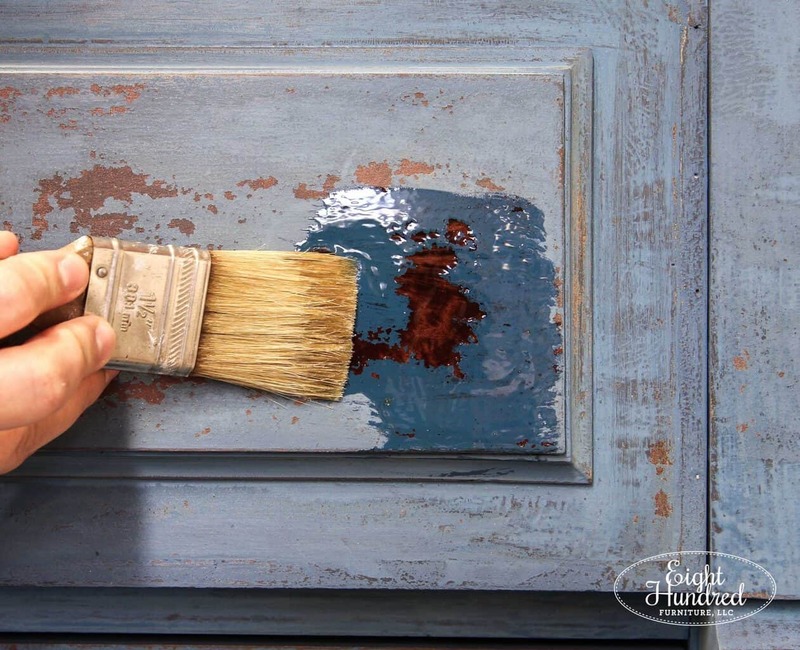 This one is from the Miss Mustard Seed’s Milk Paint line. The minute the Hemp Oil touches the surface is my absolute favorite part of refinishing furniture! Because the dresser is so old and hasn’t been taken care of through the years, it’s incredibly dry. 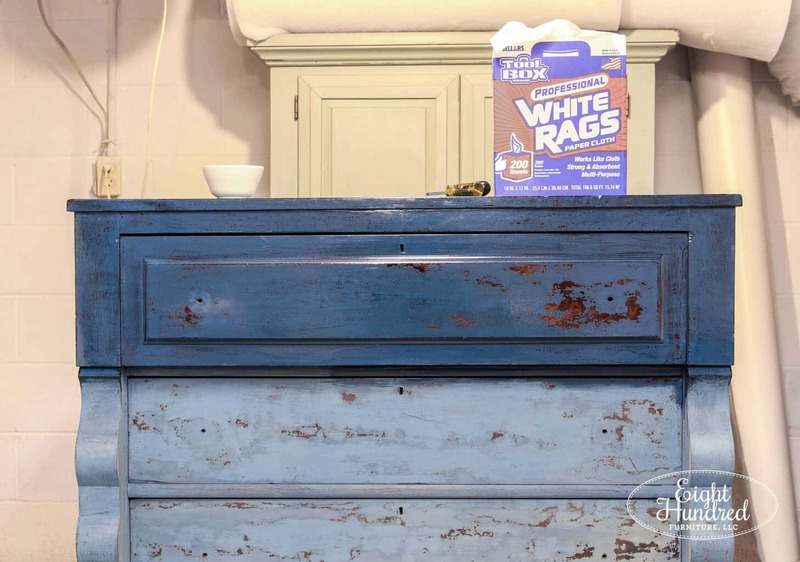 The Hemp Oil not only deepens the color of the Flow Blue and Artissimo Milk Paint, but it also hydrates the wood that is peeking through in the chippy spots. See the difference Hemp Oil makes? It’s like night and day, isn’t it?! I like stepping back as I progress over the piece to admire how it’s transforming and coming alive. 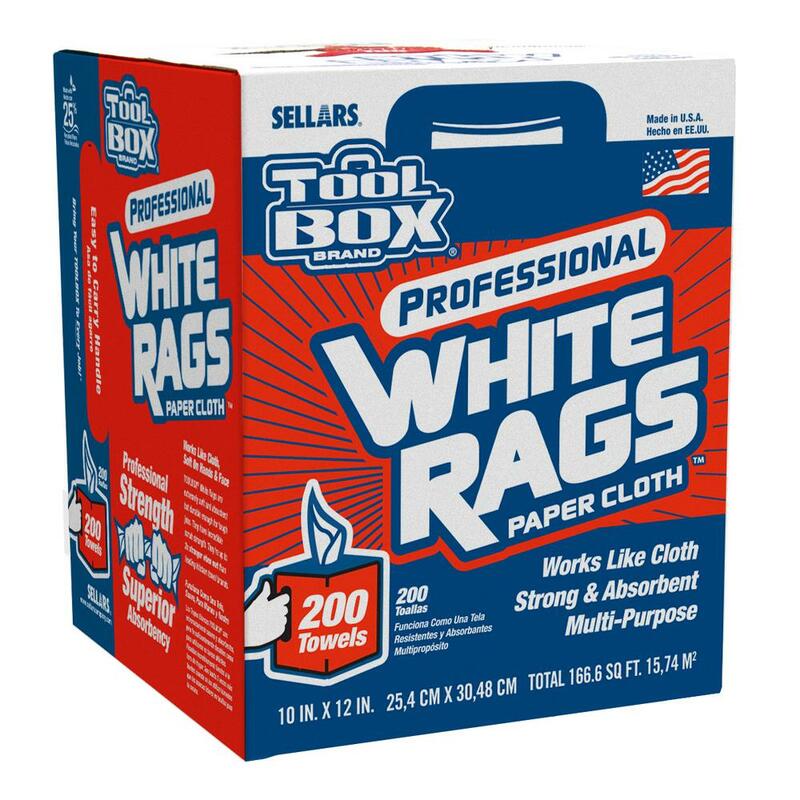 I pick up boxes of these rags in a box from the paint aisle of my local hardware store. They’re perfect for wiping away Hemp Oil and waxes when I’m finishing pieces. Before I wiped away the excess Hemp Oil, I put a pair of simple latex gloves on so my hands didn’t get oily. Hemp Oil will not hurt your bare hands. It’s safe to get on your skin. I literally just didn’t want to get oil over my hands, so I popped on a pair of gloves! Now I just have to be patient as the Hemp Oil dries overnight. 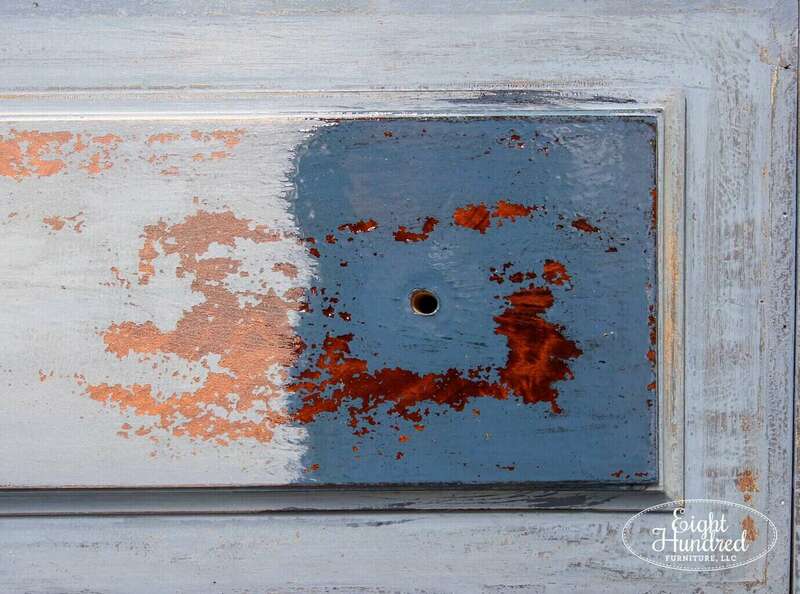 The next step is to apply Antiquing Wax over the surface to add age and patina. I like giving Hemp Oil a chance to soak into the surface and set up a bit before I wax it. I find that I have crisper and cleaner results that way, so I let my pieces sit overnight. 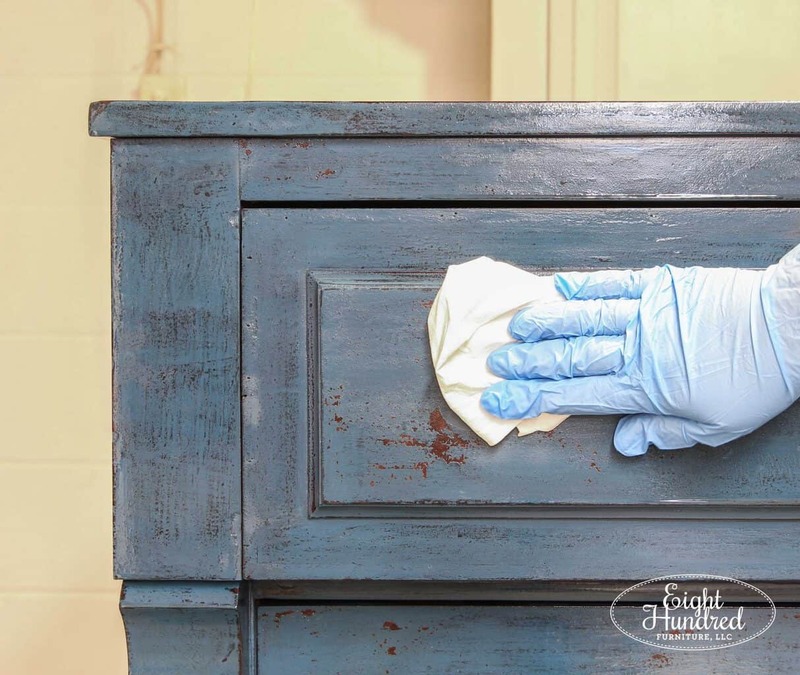 If you can’t wait and you want to see how to apply Antiquing Wax right now, you can read this blog post which has a video tutorial. Oh! And that reminds me to tell you a super important tip about combining these two finishes. So if you recall, I applied Hemp Oil FIRST and then will follow up with wax. That’s always the order you want to follow. Hemp Oil THEN wax. If you can’t remember that, then just follow the alphabet! “H” and “O” come before “W” in the alphabet, so that’s the order you should follow when you’re using these two products. 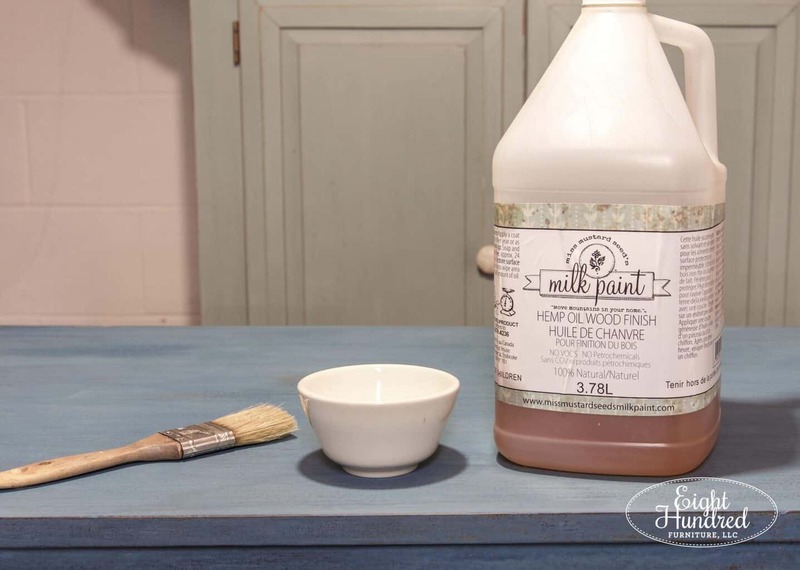 The wax finishes in the Miss Mustard Seed’s Milk Paint line go on like a lotion. They absorb into the surface to a degree and they also dry hard on top. Now they’re not hard like a water-based poly, but they do dry harder than Hemp Oil, which does not dry hard at all. 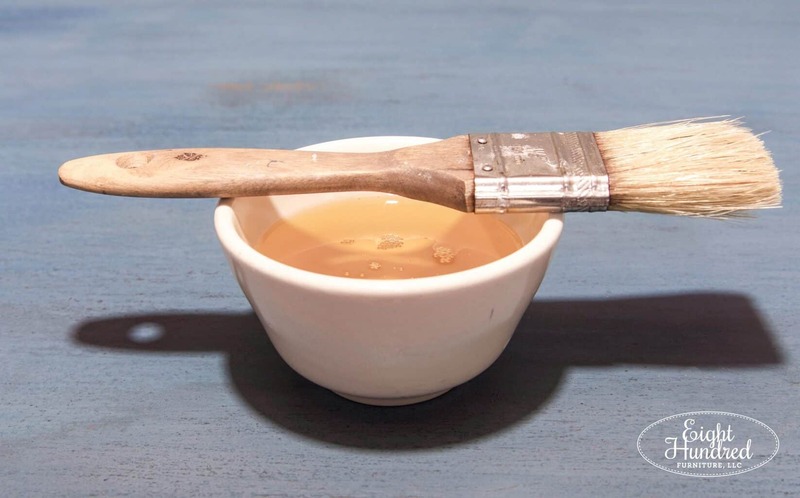 Because waxes dry hard, they do not allow any liquids (like Hemp Oil) to penetrate the surface. It’s kind of like how wax causes water to bead off of your car. So if you wax first, the Hemp Oil won’t have a chance to soak in. It’s okay if it doesn’t. Just follow the alphabet and you’ll be just fine! Amazing how the color wakes up with the hemp oil. Can’t wait to see how it looks with the antiquing wax!!! Isn’t it such a difference? I’m excited to finish it off as well!